3 Gal gas tank that provides about 3 hours of run time. The mower uses an electric clutch for blade engagement. The cutting height is easily adjusted from 2″ – 8″ by turning two cranks. 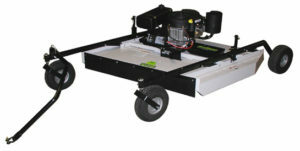 The AcrEase Rough Cut Mowers come with large 27 HP electric start engines. The four tire design used on the AcrEase provides a great deal of stability and allows the mower to traverse very rough ground. The four tire design also allows the AcrEase to use a free pivoting tongue which eliminates bind ups. 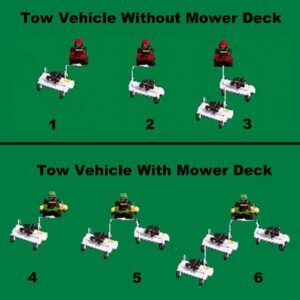 The design also places the tires within the width of the deck allowing for an obstruction free trim edge on both sides of the mower. The main deck is built out of 10 GA (.135″) steel with 7 GA (.179”) side plates. The backbone of the deck is an open channel design that is built out of 1/4” thick steel. There is also an additional 1/4″ thick steel plate welded in the blade spindle mounting location. The three layers of steel in the blade spindle mounting area add up to over 5/8″ thick. The ATV Tongue comes standard on the AcrEase Rough Cut Mowers and will allow for rapid transitions between direct behind and full offset pulling. The ATV Tongue is adjustable from side to side when overlap adjustments need to be made. The ATV Tongue also features a farm clevis which provides more degrees of motion than standard hitching systems. This is necessary because the AcrEase can be used on terrain that would bind up standard hitching systems such as a ball hitch. The blade spindles used on the AcrEase are built out of heavy duty welded steel hubs, 30 mm (1-3/16″) shafts, machined steel blade holders and large 30 mm bearings. These spindles are capable of handling 2″ diameter saplings and other unforeseen objects without any worry about bending. The twin blade design on the AcrEase provides more of a mulch action that reduces the size of the clippings and reduces bunching.